Education is one of the most powerful methods of convincing citizens and a powerful tool for persuasion that is needed in our thriving democracy. It works by making a person aware of accumulated knowledge and sensitive to the society. It has the power to transform our philosophy and motivate our actions by informing us about reality. In particular, science is the best method for keeping track of the natural world and understanding curious observable phenomena. Thus effective science education is very important, the failing of which will create individuals who fail to understand our natural world. We started the camp by giving a lecture on ‘What is Science?’ In this lecture, I adapted Feynman’s ‘The Character of Physical Law’ and spiced it up with personal anecdotes. The talk made them realize that they were never given a definition of science. Then the idea of falsification was introduced to the kids where I argued that Fate is unfalsifiable. I explained that the method of science is ‘guess-compute-compare’. I reminded them that, throughout the camp, they will be asked to make guesses and they will also be asked to design experiments that prove those guesses wrong. The idea that a falsified theory need not be absolutely wrong, in the simplistic sense, was also mentioned. The central need is to lay down the principles of critical thinking and educate our buds about the definitions unambiguously. The language that we employ to communicate our ideas can have a very alienating effect on people who have dogmatically subscribed to certain philosophy. This can be very damaging since this will also encourage kids to believe that there can be different kinds of truths and the scientific truth is justone among them. It would grant them the freedom to believe that there are theories of the non-scientific kind that can explain the natural world. In a way, such language tolerates ambiguity that serves as a breeding ground against naturalistic world view. In our camp, we put in effort to ensure that the term science was never used. 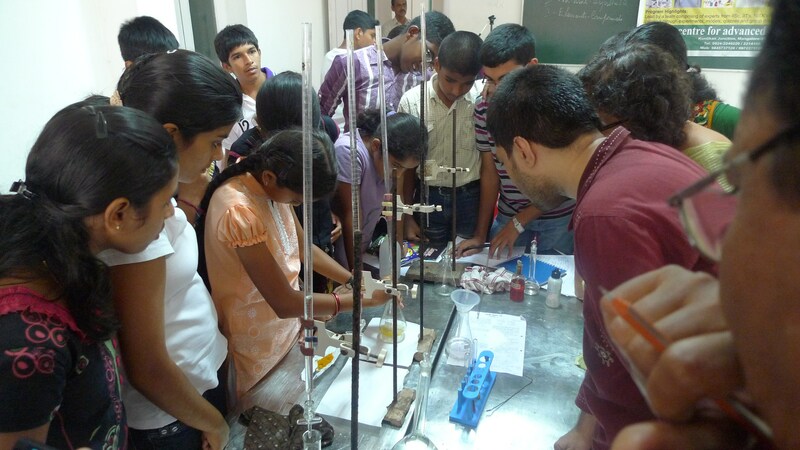 Experiments were performed and all the students were invited to guess. When the students were asked to explain what they saw, they pitched in a lot of guesses. Most of their guesses were disproved by students themselves. When I saw that the students were enjoying, I told them that scientists did this for a living. It was repeatedly urged that this method of obtaining knowledge looks very efficient. To include kids in our goal to promote critical thinking, we must make the whole process of science accessible to them. We have to be careful with our language aiming to be inclusive and supportive. The basic missing ingredient of our education system is the lack of experience. Our experiences shape our passions, beliefs and actions. Teaching a subject in the abstract, without performing experiments, encourages the students to accept theories without reasons. So, our summer camp introduced concepts only using experiments and all the students were given the chance to perform every experiment. Around six instructors were walking around willing to help students and answering their queries. However the important idea was to show them that the experiments can be set up using easily accessible devices. Fellow teachers told them that bottles, balls, bucket, yo-yos, baking soda, vinegar and many other household items can form peculiar combinations that are waiting to be studied. This dispelled the myth that ‘one can perform experiments only in a laboratory’ and encouraged everyone to perform experiments. The hope is that the kids will start seeing science in their surroundings, thereby integrating the scientific method as a part of their life. To persuade kids to enjoy science, I think that educators themselves must be enjoying every aspect of it. Lack of energy in a teacher will translate a fun science activity to a boring lecture. Teaching is partly theatrical in principle, in the sense that the teacher should know to emphasize certain points strongly, express an idea with enthusiasm, deliver talks eloquently, engage the kids with dialogues and have good steady eye contact with its audience. I tried following these principles and I have observed good results in establishing a rapport with the young ones. However passionate teachers tend to have a good, healthy influence on kids. 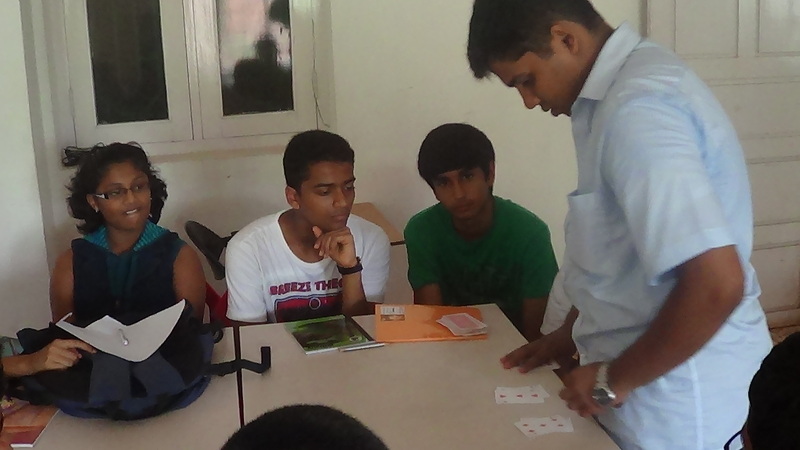 In our camp, we allotted the mathematics training, among faculties, according to their passions. This had a very good effect and the students were thoroughly enjoying by discussing concepts with the respective faculties. 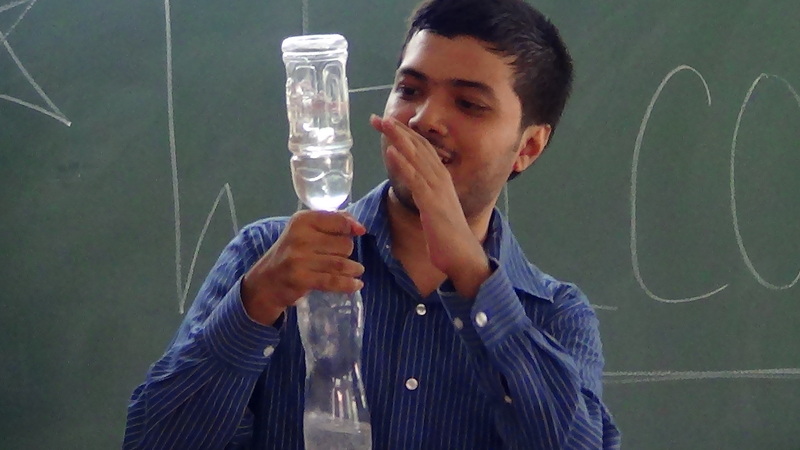 To inculcate persistence, I gave an impossible problem to the students (to construct 20 degrees using a straight edge and a compass). Some students have tried to contact me to this date and find out an answer. It is satisfying to know that the summer camp has created an itch of curiosity to which some are relentlessly trying to scratch and satisfy themselves. One of the most instructive and enjoyable experiences at the camp was our attempt to figure out the puzzling behavior of the Newton’s cradle. Newton’s cradle is an arrangement of 5 pendulums placed in a row so that the steel bobs touch each other. The question we asked the audience was: “What do you think happens when we release a bob from one end?”. I and a 12th standard student proposed competing hypotheses for this observation. He claimed that the four bobs (other than the released one) were touching each other and hence form a system. He used energy conservation and momentum conservation equations to claim that the released bob will move back and the system of four bobs will move ahead for a short distance that can be calculated. I proposed that all the four bobs are independent and there would be a continuous transfer of momentum across the bobs and thus the last bob will move up and the released bob will come to rest. Even though both of us were following the same principles of physics, our hypotheses could give rise to readily conceivable situations. Before I performed the experiment to resolve the conflict, I pointed out that the mind can fancy both hypotheses as reasonable; however Nature will tell us which is more likely. Thus convictions that our mind cooks up, without real world evidence, are arbitrary. We finally performed the test and my prediction was right. Later we performed variants of this experiment by releasing two bobs, joining two bobs and releasing them, and so on. The kids were more than willing to proposed hypotheses and test their claims. It was an enjoyable experience for all of us. In mathematics, the students were boggled by the 1=2 fallacy, Russell’s paradox and a lot of students were debating whether 0.999….. = 1. We answered the doubts of students by returning questions to students, but never telling them answers. Some students asked “what are the angles one can draw using a straight edge and a compass?”. I was not completely sure of the answer and I admitted that to the students. In physics, many questions related to movement of an airplane were not known to me. In retrospect, we had too much of material and three days were not enough to cover it. We had to rush certain mathematics sessions and some students were not satisfied with the time allotted. The experiments in Physics were mostly based on mechanics, fluids and electricity. We did not perform any experiments on optics and heat. In Mathematics we neglected algebra because of lack of fun material on it. The biggest regret of the camp was squeezing Chemistry and Biology sessions into the last day. This was patently unfair and we realized it when half a day was not enough for students to perform even very simple experiments. We have plans of starting a ‘Sunday school’ where kids meet every Sunday for two hours to solve interesting puzzles, play around with experiments and learn to enjoy science. I wish that we can design a schooling system that teaches both sciences and social sciences in a creative manner that stresses the importance of these subjects and taps their passions. I wish the students would be informed about the abundant variety of lucrative fields of study that exists, so that they can decide a vocation that matches their passion. For this dream to be fulfilled we will require passionate individuals, preferably with some teaching experience, to dedicate some time and energy. One of the plans, in the pipeline, is to conduct a mathematics Sunday School in Bangalore and I am looking for volunteers who can teach a few kids interesting mathematics. This summer camp was an experiment to see if we can address: ineffective science education and a lack of critical thinking among kids. The success of our experiment shows that it is possible to motivate kids when we put in effort, in the right direction. We, at Nirmukta, should promote educational methods that helps create reasonably skeptical and socially responsible citizens. The agenda of freethinking is generally pushed by forming rationalist associations that debunk, and disprove pseudo-scientific practices to adults. At the same time, let us encourage educational methods that mould the younger generations to understand the agenda of freethought. This two pronged approach of sandwiching the generation into critical thinking can be a powerful strategy to fully utilize the latent scientific potential of our country. You can see the news coverage here and here. Rationalism From Mangalore To Chikmangalore! Spai is a Ph.D student at IISc, Bangalore. He is mainly interested in mathematics, ethics, economics and physics. He is a liberal skeptic and wishes to be an educator. His goals in life are to find creative ways to teach effectively, promote critical thinking among kids and develop schooling/education methods that foster humanistic virtues. Awesome work, SPai! Lovely account. I just love your approach to teaching these kids the scientific method. You have done a good job in emphasizing to the kids scientific facts are really besides the point, and they anyway learn that in school! 🙂 Few people appreciate this important distinction between rote problem solving and learning to apply the scientific method for each and every science problem one encounters. The way I try to teach mathematics is by complete focus on problem solving. We derive all the results from our natural questions. I just let the students ask any question and go where the discussion takes us. It has worked wonderfully as of now. This method works if there exists a few interested students. If not it fails. On higher levels (undergraduate, graduate), a lot of students are resistant to trying things on their own. There are no theorems, chapters but a seamless transition of curious puzzles that need investigation. At 11th standard level, I can teach most subjects like that except trigonometric identities, and analytic geometry. At undergraduate level (E n C), I can teach signals, system, electromagnetics and communication subjects with a mix of linear algebra and probability in that manner. At a graduate level, I have informally tried teaching analysis and linear algebra in that manner. As of now, it is an humble attempt. But it is well received. People have responded constructively to this style at all levels. My aim is to organise and formalise efficient methods of teaching. I hope I can succeed. Great work! Thumbs up for the sunday school idea!! Would have loved to join you. Do get in touch. There were a few similar ones for math and science. I can’t remember their names. Whole of South Kanara Dist appears to be Trapped in the medieval period. Children are the only Hope. S.PAI ‘s spirit should spread to the whole dist. Here is an article in The Hindu on the occasion of Srinivasa Ramanujan’s 125th anniversary where eminent educationists speak of the need for reforms in mathematics education and ‘catching them young’ in the field of mathematics.